Synopsis: Ian Noble here proposes a fresh analysis of Céline’s writing which critically examines and brings together the different parts of this traditional image of Céline. New light is thrown on the place of Céline’s novels within the history of the genre and close analysis of a carefully selected cross-section of his novels, drawing on modern critical methods of textual analysis, shows how their use of language and their structure radically question the assumptions of the realist novel in terms of narrative, representation and the identity of the writing subject. These close readings show how conflicting demands of order and disorder lie at the heart of Céline’s novels and his pamphlets. 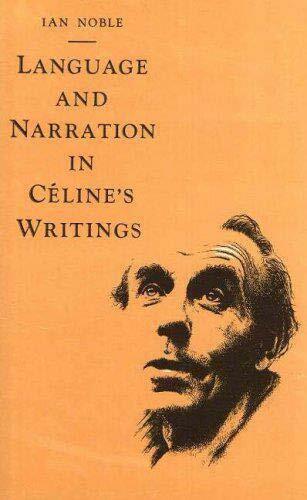 A detailed analysis of the figure of the Jew and its functions in the anti-semitic texts illuminates the disturbing connections which exist between this murderously reductive vision of the world and the most invigoratingly original aspects of Céline’s writing. Noble's book provides important new insights into the works of an author now recognized as one of France's major novelists this century. The analyses offered here remain sensitively close to the complexities and tensions of the writing itself, while firmly setting the texts in a critical and theoretical perspective appropriate to their modernity.